Generally regarded as being a producer of some of the better quality Japanese toys throughout the post war years ALPS was originally founded in occupied Tokyo, Japan in 1948 by a former employee of CK – Kuramochi Shoten, then the largest pre-war Japanese toy company. Its distinctive trademark / logo has the word ‘ALPS’ superimposed on a triple peaked mountain and makes it toys relatively easy to identify. ALPS produced a range of tinplate / mechanical toy vehicles, space toys including robots along with numerous animated novelty animals. Many of their early toys had multiple action features which was to set Japanese toys apart from their European / American counterparts and it was this ingenuety which ensured the popularity and demand for Japanese toys in the early post war years. Many of which were either clockwork initially or later battery in operation. Despite their obvious success in the toy market ALPS decided to abandon all this in the early 1970′s and to concentrate all their manufacturing efforts and expertise into the larger and more profitable consumer and industrial electronics marketplace. ‘Made in occupied Japan’, a very early ALPS product, tinplate, red bodywork finish, white balloon wheels, plated parts, clockwork operation, permanent key, 15cm. 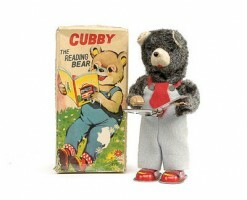 Clockwork bear figure dressed in dungarees, raises head and turns over pages of a tinplate book. Originally came in colourful illustrated card box. Seated grey bear on lithographed tin-printed base. Holds plastic cup in one hand and a bottle in the other. Battery operated toy, bottle pours and cup lifts to mouth and eyes light up. Originally came in colourful illustrated card box. 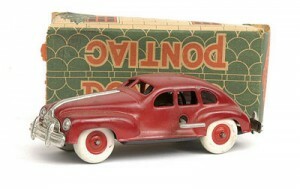 Large scale tinplate battery operated American sedan. Red bodywork with cream panels and roof. Detailed tinprinting to interior, plated parts including hub caps to white wall tyres. Operating headlamps, steerable front wheels, 30cm. 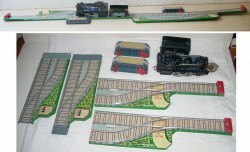 A 1960′s battery operated tinplate and plastic model. Grey with detailed tin-printing, walking action with moving arms. Illuminated mouth piece with rotating eyes. Moving space scenes to chest TV, antenna functions as on/off switch, 38cm. Came in colourful illustrated card box. 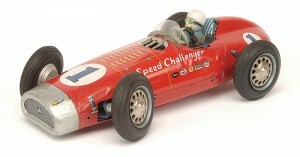 Based on a Mercedes racing car this large scale ‘Speed Challenger’ racer from Alps was battery operated, tinplate in construction. Red with detailed tin-printing and carried the racing number 1. Plastic windshield and driver, plated parts including hub caps, fitted with rubber tyres and steerable front wheels. On/off switch fitted to side of cockpit. 30cm. I have a toy wind up bear playing ,cymbals when wound. It’s in a box #A2110 pat.382582,reg.96168 . It has trade mark ALPS made in Japan. Registered trade mark made in rvt Japan. Can you tell me anything about it ? Thanks for your question Ethel and for a while you had me stumped ! The only Alps bears I was aware of were a couple of ‘drumming’ bears, neither of which cross referenced with the other bits of info you provided. So I had to do a bit of digging before I realized your cymbal playing animal was not a bear but was in fact a monkey !! Alps did two cymbal playing chimps – one, which I think is your toy, was known as ‘Musical Chimp’ sub titled ‘The Band Leader’. 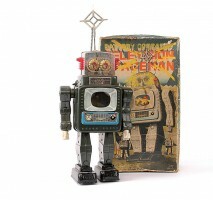 Produced sometime around the late 1950′s early 1960′s, clockwork in operation and stood some 23cm. in height. Many Japanese toy companies of this time carried not only their name/logo but also a secondary identification mark, in this case that of VIA – Rock Valley Toy Co., which may well be its American distributor. Although it is often argued that several of the largest Japanese toy companies did not manufacture themselves but sub-contracted to other much smaller companies. Unable at this stage to source info on Rock Valley. The second cymbal playing monkey from Alps was titled ‘Jocko – The Band Leader’ and was identical to the ‘Musical Chimp’ version but came packaged in a different pictoral box. Hope this is of some help. I have a ALPS toy tokyo (111) Japan ‘Melody Doll’ -there is a numbered sticker on the box:2700A. It is a doll with big eyes that turns on a mechanical motor to the theme from Love Story. It’s boxed and in really good condition. I guess by the clothes it’s 70s. Do you know any more about it? Does it have any value? Marc, I’ve got to hold my hands up here and admit that I know absolutely nothing about toy dolls. Had a look through the reference books I’ve accumulated over the years and drawn a blank there as well. I know they did novelty dolls like the ‘Hula Dancer’ but that’s about the limit of my knowledge. The Love Story theme music didn’t come out until around 1970 which was around the time that Alps was withdrawing from the toy sector so may have been a ‘bought-in’ item from another manufacturer. Will keep looking but if anyone has any info on this item for Marc please message me. Sorry I can’t be of any further help on this, David. thanks dave – anyone else got any info?! I am currently doing research on ALPS toy robots but can’t find any stories attached to them, only short ones. I wonder if they produced these toys (examples: television spaceman, mechanical television spaceman) have any side-stories to them? I would be wonderful if you could help. Hi there Bean, not quite sure what you are looking for, can you be a little bit more specific please. I have put the basic info re Alps as a company in one of my previous listings with a little write up on a few of the toys they produced. Are you looking for more info on just the robot element of their toy output ? Message me back with your thoughts – cheers, David. Ihave a tin wind up hobo clown playing marraccas, I think it’s an Alps but not sure. The shoes and outfit are exactly like other clowns I’ve seen by Alps. ANY HELP? I was given Tin Toy Steam Train battery operated when I worked in the US, its Black and says ‘N.Y.C 723′ on the rear it says Alps Japan can you date it and I was thinking to sell it? The train you have came as part of a set sold as the ‘Shuttling Switcher Freight Train’ and this, or something very similar, was also marketed in the United States by Cragstan. The set itself comprised the engine (loosely based on a Union Pacific locomotive) with running number NYC723, its coal tender, 4 pieces of straight track and two ‘switches’. The train itself runs along a predetermined route along the track and down the sidings but cannot actually be ‘switched’ as there are no switching points as such. The set itself is tinplate in construction and colour litho printed. The front of the locomotive opens to reveal the battery compartment. The set would date to somewhere around the mid to late 1950′s but I have no idea of its worth as I have not seen a complete set sold. Individual component parts of the set therefore are relatively worthless in their own right. Hope this info may be of some use to you. Hello Catherine, Alps made a variety of these US western stage coaches amongst which was the Wells Fargo Overland Stage and the Butterfields Stage Line models. All were tinplate in their construction, multi-colour tin printed with passengers looking out, some firing guns. On some the shotgun rider was laying on the roof as if firing. Your model has four horses but some had just two but in all cases the horses were modelled as if galloping. As far as I am aware all were mechanically driven either clockwork or battery operated. I know the Butterfields Stage Lines model came in two versions ie two or four horses and only the four horse version had the word ‘Texas’ printed on a white banner across the coach sides. 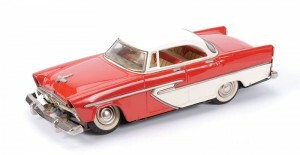 All these models were produced from the mid 1950′s through to around the mid 1960′s. I have a mechanical jumping frog. Boxed. It has a felt covering. There is a butterfly on a wire from its mouth. When wound it croaks and jumps. Cannot find any reference to it for value purposes. Both box and frog are in very good to excellent cond. Hi there Gerald, sorry mate nothing ‘springs’ to mind on this. Triang as you may know did a ‘Kitty and Butterfly’ which sounds similar and certainly Schuco did a felt covered jumping frog but I have not come across one with a butterfly attached. A picture of the box may help especially if it has a logo. Bear in mind that there is a whole host of clockwork items coming in from Eastern Europe and China. Without knowing its manufacture its difficult to say its worth but generally small mechanical animals don’t realise much at auctions and tend to be organised in lots averaging around £10 – £20 each item for something like Schuco. Sorry I can’t be more specific, David. I have a wind up toy with a bird that hangs down the center of a mobile that attaches to a pink and yellow oval with jingle bells hanging down that jingle when wound up and the mobile spins around and the bells hit the blue balls on a pink dome the bird is hanging from. Printed on the box is ALPS—-New Idea Toys made in occupied Japan. Can you tell me anything about it and its worth, it was for a little girl cousin who died at birth in the early 1940s. Hello Faye, well I’ve searched high and low but can find no reference to this Alps toy. The only thing that came anywhere near is a reference to an Alps (Japan) baby’s musical nursery carousel. Wind up toy comprising colourful mobile with illustrations of a boy riding a circus elephant to the main body of the mobile, the hanging bird appears to be a parrot ? Item sold as part of a lot for £10 back in 2010. Sorry but that’s all I can find. I have a Ellie the little Maltese and I got it out and it will not work and the leg broke off in storage . do you have any Idea if this is why it will not work . Hi there Nancy, as you may well know ‘Ellie the little Maltese’ was one of a whole range of battery operated toy dogs to come out of the Alps factory sometime around the 1970′s, none of which are of any particular monetary value. I’m not familiar with this particular model but the majority were of a tin/ sheet metal frame construction with a fabric covering. Quite often the battery compartment was housed within a hand held remote control, although I have seen some with the battery box within the dog itself. Usually the dog performed some sort of action ie walking, turning somersaults etc along with a barking noise. I cannot say for certain but I would have thought it unlikely that missing one leg would cause it not to function as the legs were simply a means to an end, in other words they would be fitted to an axle arrangement for walking etc. With these toys its more often than not either the contacts within the battery box or the cable itself thats the problem. Sorry Nancy thats the best I can come up with, David. My name is (Mr.) Stacey Bindman. I am a blogger who writes about old and antique toys. I did a search for ALPS toys, and came across your fine website that is quite informative. I used your written narrative on the ALPS toy company, but paraphrased the writing for brevity. I added a link to your website, and am asking if I might use your written material on the ALPS toy company. Also, I’d like to write a future post about you and your blog – it’s quite informative and educational. Somewhere on your blog, there were stats of page views and viewers. Your numbers were astronomical, to say the least. What is your “magic secret” to have people to come to your website? I have 1410 or so posts on toys, and yet my daily numbers (low compared with your website) range anywhere from 100-300 pageviews, including the spammers. Please have a look at the post. I’ve added a link to your website, and when you give me a bit more information about yourself, I’ll add that to the post. Should you not want me to use your written material, I’ll remove your material, and your link. Hi there Stacey and thanks for your positive comments regarding the site, by the way the names David not Roger, but I’ve been called worse. I’m more than happy for you to include any information you might find useful on these pages within your site and thanks for adding a link from your site to mine, that makes a refreshing change (are you listening toys in time ?) and I will add your site details in my ‘Links’. Information etc from my pages has already been included in several published books and the more we all keep old toys alive the better as far as I am concerned. Hi, I’m hoping you can help I have a Alps mechanically bear which in its left hand looks like it’s holding a bottle tomato sauce and in its right what looks to be a hamburger. I have searched for a similar looking bear on many sites with the closest bring “thirsty bear”. If you have any information on this it would be most appreciated. 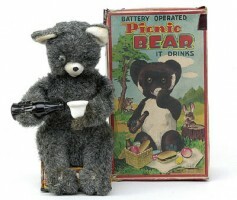 Your mechanical bear was just one of many post war animal toys produced by Alps, the majority of which were either in the form of bears or monkeys. Your bear was known as the BAR-B-Q bear standing some 7″/18cm tall, ketchup bottle in one hand and a hamburger in the other. Not much more I can add to what you will already know other than I would say that the BAR-B- Q bear is perhaps one of the harder to find of the animated bear figures that Alps produced. I have added a picture to show the card picture box he came in. Hope this bit of info is of some use, David. Hi there Vicente and first of all let me say sorry for not responding to this query earlier. I do not tend to give valuations anymore unless I have come across an item recently at auction. As I have repeatedly said there are just too many variables to give a true valuation … is the model boxed ? … box condition ? … condition of the model ? … is the model complete ? … does the motor work ? … does it come with its original key ? … and so the variables go on and on. One only has to attend a toy auction to the same model attain a totally different price than a similar model sold the previous month or even the same day ! and at the end of the day its only my opinion which would no doubt be totally at odds with someone else. As I keep saying take your model to your local auction house, ideally one which has specific toy auctions rather than a general sale. These guys make a living out of this and most will be happy to give you a free valuation without you having to commit to selling your item. Not only that but the value would be specific to your location rather than a price achieved in another town or even another country. All the best and thanks for visiting, David.